Wow … what a weekend of food! I mean I spend most of the weekend immersed in the world of food and wine, other than my walk around the golf course this morning to wear some of it off. I love everything about food. I love eating good food, I love cooking food, I love watching other people make food, I watch the food network on television and I take pictures of food. When we cook at home it isn’t usually a half-way affair. When I say we, I really mean me because I get into it. Not that Kendra doesn’t cook, but I often don’t make room for her in the kitchen. I love the creativity, I love working with my hands, I love the nurturing aspects of making sure things are watched and coddled along to their perfect state. So its tough for anyone to push me out of the kitchen! Last Saturday was a perfect example. We had four friends over for dinner and it was a really nice evening. Great people, great conversation, great wine and hopefully great food. That was the evening. The morning was spend shopping for everything we needed, and my afternoon was spent in the kitchen. At least four hours standing at the island chopping, preparing, planning, pre-cooking, making appetizers and cleaning up. I was totally immersed in it. 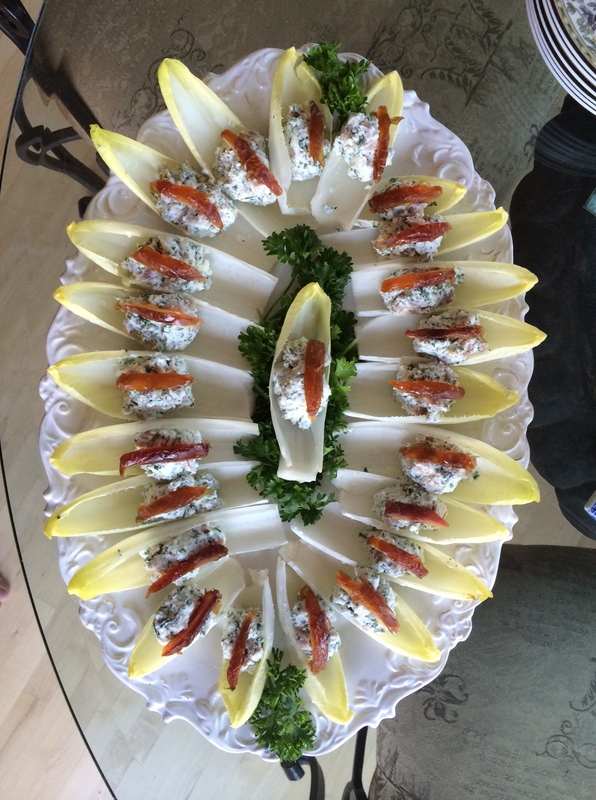 Appetizer of Belgian endive spears stuffed with herbed goat cheese, prosciutto and medjool dates. A beautiful heirloom tomato, arugula and mozzarella salad prepared by our friend KR. All in all I would say that there was seven to eight hours of work that went into that meal, and that doesn’t include all of Kendra’s efforts to make the environment welcoming and provide a table that would welcome our guests visually … at least another three hours. What’s amazing about the whole thing is that I would estimate that we spent less than an hour eating! Imagine that .. a 10:1 ratio of preparing and doing! 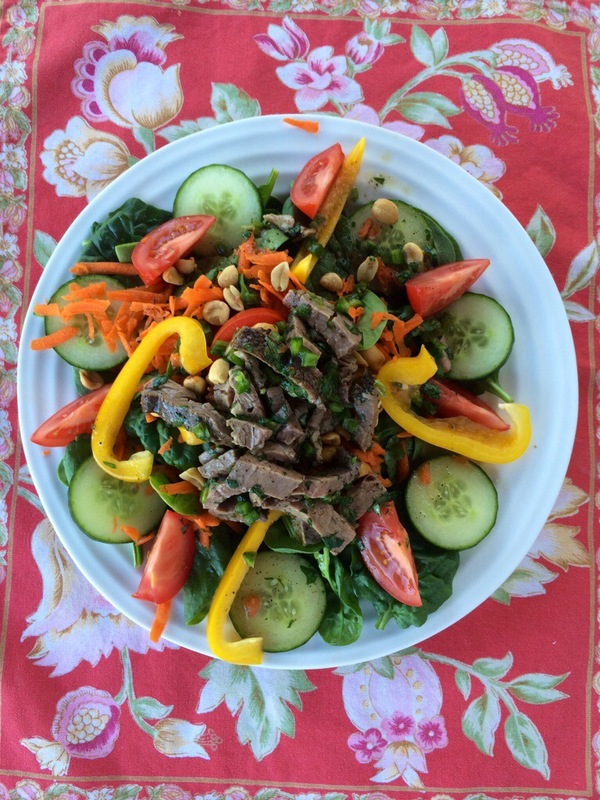 Thai beef salad – leftovers from the tenderloin! Then for good luck I did it all over again Sunday afternoon making a tomato sauce from scratch … peeling, seeding, chopping and cooking it down over several hours. I met with my coach, mentor and friend Kerry Parsons on Friday (you guessed it … food was involved). We had a great discussion, but one question Kerry asked me was really the trigger for me writing this post. She asked me what it would take for me to fully commit to doing everything I need to do in order to make the shift from my current career into my planned future as a coach in the field of essential leadership. As I was preparing these meals our discussion kept coming back to me with cooking as a metaphor for life. Am I willing to do all of the preparation in my life that will allow me to partake of the “meal” or results of my work to make things happen for myself? It’s an interesting analogy. My answer was an immediate yes, but I want to spread that effort out over time. Some meals are made that way, but for most the preparation is done all at once. What would need to change for me to do that? Am I comfortable doing that? What would stop me from doing that? If I don’t do that, will I get to where I want to be? The bottom line for me is that I think I’m comfortable with my plan to do things a little more slowly, but I really did see that no matter what the plan, the preparation has to be done before you can eat. That sounds so obvious, but when we are talking about change and about personal growth sometimes we don’t fully embrace our part in making it happen. 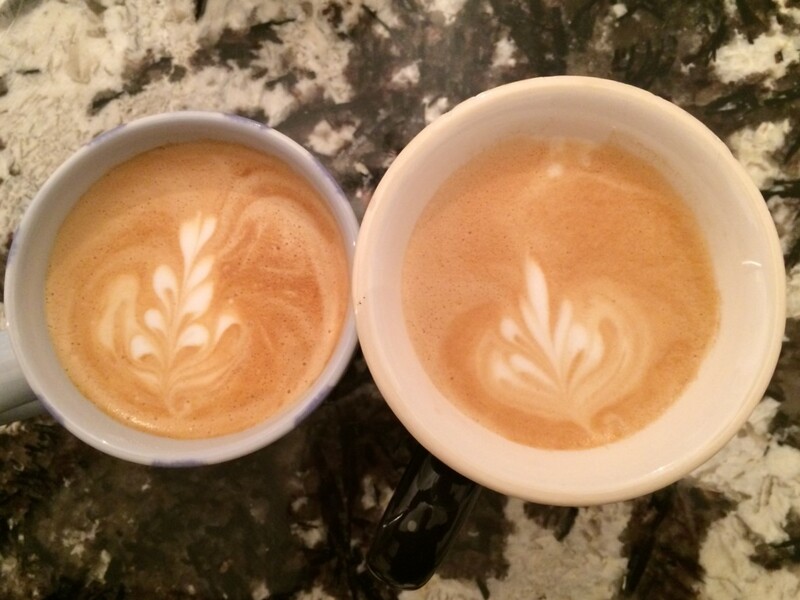 No meal is complete without coffee! As leaders, how do we support our team members through this journey? Do we inquire about their dreams and plans? Do we ask them what it will take for these to come to pass? Do we make resources available to them that will assist them on this journey? Do we, in the most supportive way possible, hold them accountable to their own dreams and plans such that they can partake in the meal that awaits? Let’s not wait. Let’s just get at it and cook up a feast! What a mouth-watering post Ian! Your cooking is Art. I met Kerry once, through Louise. I really had no idea who she was. After our brief conversation she suggested that I am ‘an applied visionary’ – that I see what will be and then roll up my sleeves and get right into it. Sounds a little like your cooking fervor! How do we support our team members, or family members for that matter, or friends through their journey? A great question Ian – one that I will need to think about some more. Thanks for your thoughts Diana! Loved your post today btw! I think it is important for us to show up as our fundamental/essential self like your applied visionary. My essential skills are builder and facilitator. These aren’t “get right into it” approaches in that I have to create the construct first, preferably by working with a team. Those things tend to be both incremental and evolutionary. You’re welcome and thank you! It’s good to know how one ticks! And in those places we’d see that everything we are doing is all about not just prep for the great feast but creating a feast of every moment. At my retreat this past week, we spoke a lot about letting go of the outcome throughout the creative process. It can be challenging and hard. It can be elusive. To let go of outcome means to create without expectation of how our creations will be perceived or received. Like work — how do I turn up and share my best without expecting others to pay homage to my creation but rather, holding space for others to share in my creations as I share in theirs? which is what I see in you preparing your meal(s) — you are creating an experience, a place, a community — in which magic can happen… whatever that magic will be. Love this post — and…. your creativity. Love this response … And your essential thinking! “To let go of outcome means to create without expectation of how our creations will be perceived or received.” That’s beautiful. I might add and that we trust that our creative efforts will produce what is desired our needed when we let go of any fear attached to outcome. Love the food and the analogy. I am not a cook, but love being on the receiving end .. enjoying the results and the care and passion that went into it … just like your coaching clients appreciate the care, passion and expertise you bring to coaching. On my coaching journey, it is really important to pace myself with my more than full-time job in addition to coaching, family and fun. Thanks for the reminder. Thanks for joining in Sara! I think you’ve captured a really important point … that of care and compassion in our preparation, no matter the task! One thing left out of your post. Did you use a recipe? Or did you invent your own recipe? What about the meal plan? Yours or from someone else? Just curious how that fits in with the life plan too. Is it a tried and true recipe and meal plan, or one of your own making? I so love your incisive questions Elizabeth! They usually cut to such an important part of the thought and this is no exception! The idea of following a plan vs. plotting one’s own path is important! Some are gifted operators (follow a plan) whole others tend more towards uncharted territory. We are in need of both in our world … All that really matters is we show up as who we are essentially. BTW … I’m not a fan of recipes, except as an avenue of learning. So there’s my declaration as an explorer! I am sure you will go into coaching with as much enthusiasm and fervor as you do with your cooking. Thanks Karen! I hope that is completely true!